Many of us have PVR boxes like Humax HDR Fox T2 in our homes to record the TV shows and movies that come on while we’re out of the house. While we watch the shows they record on our HDTV, do you know you can bring such kind of convenience to iPad? Having all of the Blu-rays, DVDs, shows and movies we’ve recorded on PVR transferred to our iPad can be excellent for traveling or a morning commute. However, the recorded PVR files are not compatible with most devices and apps, to enjoy such files on other devices except on HDTV, to play Humax HDR Fox T2 PVR TS videos on iPads without adverts, we have to convert PVR to the supported formats like MP4. How to convert Blu-ray, DVD and Humax HDR Fox T2 PVR recordings to iPad supported format? 1. Add Blu-ray, DVD or PVR recordings. Click the top left disc-like icon to import Blu-rays and DVDs. Copy the PVR files to your computer and run the PVR to iPad Converter. Then add the PVR files to it by dragging and dropping the selected files to the application. 2. Choose a proper format for iPads. Click the “Format” drop-down list to choose target video format. 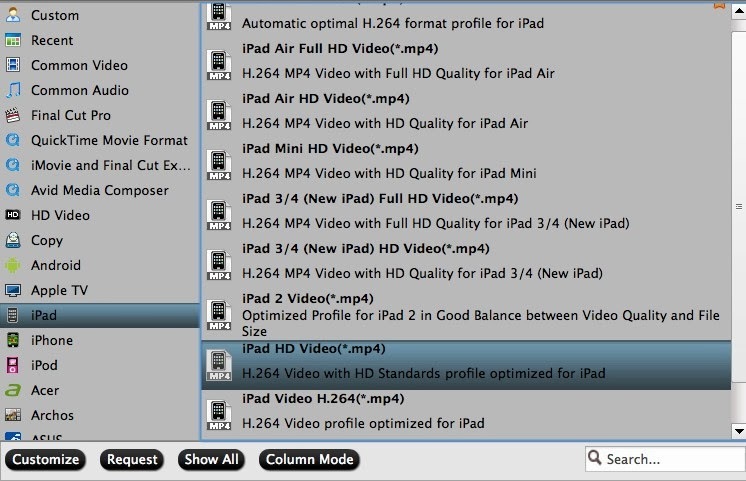 There’re lots of presets here so we just need to find “iPad” column, and choose the profiles according to your iPad model. 3. Remove commercials from PVR recordings. Now back to the main interface; hit the pencil-like icon on the top to enter the video editor. It’s on “Trim” mode by default. Drag the two small triangles on the progress bar, you can customize the start/end point. Or you can submit the start and end timing on the below. 4. Start the Movies and PVR recordings to iPad Conversion. You can hit the big red “Convert” to start converting Blu-ray/DVD/PVR recordings to MP4 with best video settings for iPad Air, iPad Mini 2 and iPad 4/3/2/1. After the conversion, click “Open output folder” in the conversion window, or “Open” in main interface to quick locate the converted video. Now drag the video from the video folder of iTunes to the video folder of your iPad. Wait for it to transfer over. Eject your iPad from your computer and scroll through to make sure the video transferred successfully. How to sync video, music, photos, iBook to iPad Air? How to Watch Instructional DVDs on iPhone/iPad/iPod?